LGBTQ? All the Letters of God's Alphabet are Welcomed Here. Sunday Mass:10:30 am in the Sacred Space at First Christian Church in Olympia. Entry door is on your left as you go up the ramp at the Church, and before you reach the social hall. We welcome people of all ages, all abilities, all sexual orientations and gender identities, all nationalities and ethnicities, the poor and the rich, single people, and the many forms of family. We will meet in the home of one of our parishioners this year, and after the liturgy we will share a simple meal of soup and bread. 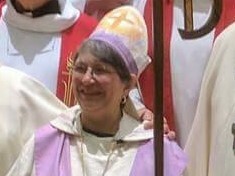 Mother Kedda was consecrated an ECC bishop in October of 2018. The new diocese takes in three states: Washington, Oregon, and Idaho. Pictured with Presiding Bishop Francis Krebs and Bishop Raphael Adams. The Most Rev. 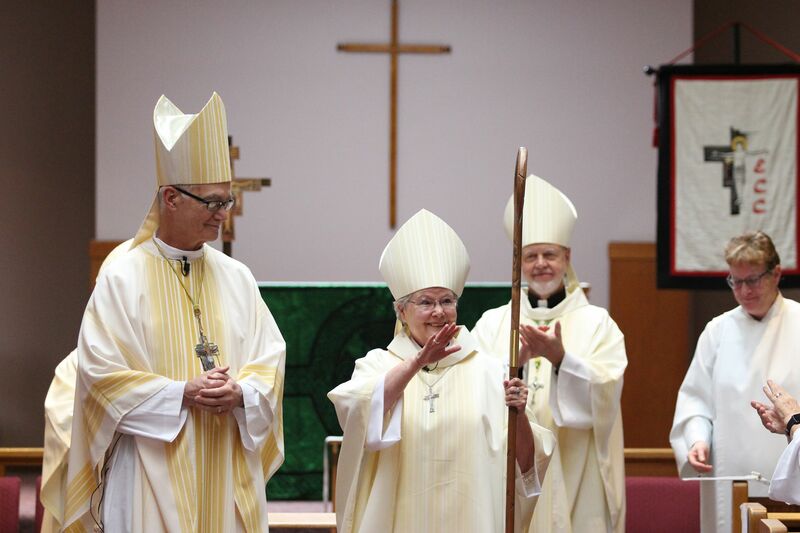 Denise Donato was ordained an Auxilary ECC Bishop on February 9th. Bishop Francis, our Presiding Bishop, has published a video with a short summary of the heritage and history of our Ecumenical Catholic Communion. You can watch that video HERE. Please visit the ECC Website for a directory of ECC communities, and for messages from our Presiding Bishop. Go HERE for that website. To receive our community Newsletter, send an email HERE. PRAYER REQUESTS -- We invite you to join us in praying for these requests. You may add your own requests by emailing us. What does it mean to be Catholic? Read more about our Catholic Identity .... HERE. Are you an Ecumenical Catholic or a Roman Catholic? Take the test HERE. Emmaus ECC seeks to provide an inclusive and welcoming Community, sharing the richness of the Catholic faith tradition, open to a progressive theology, available and accessible regardless of age, race, national origin, religious affiliation, gender or sexual orientation, and welcoming all regardless of differing abilities. We desire to provide a source for deepening an individual's personal commitment to the life, teachings, and spirit of Jesus through prayer, study and mutual support. We also seek to be engaged in social justice outreach rooted in Christian gospel values, interacting with the wider community. We are a gay friendly community. We are happy to welcome those who have no Church to call their own, who have left a Church or never belonged to a Church. Come where we believe what we pray, and where we seek not only to be comforted by God, but to be challenged by the Good News, the Gospel of Christ. ECC: A wonderful way of being Catholic! 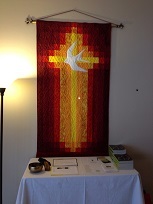 Pentecost Banner. A Gift from Connie Hanser to celebrate the birthday of our Emmaus Community on Pentecost of 2007. Our liturgy is prayeful, meaningful and Catholic. Liturgy by its very nature is the work of the people. Catholic liturgy has many traditional elements: The gathering rite, liturgy of the Word, transitional prayers, liturgy of Eucharist, communion rite, and a final blessing and sending forth. We provide worship aids for participants so everyone can follow along and pray with us. The full and active participation by all present is the aim of our liturgies. In our liturgies we believe that God is still speaking to us, Christ is still proclaiming the Good News, and we are responding to God in our prayers and in our songs. We believe in reverence at mass. The first step is to do all we can to recognize the presence God, and the presence of Christ in one another. The purpose of our liturgies is to build up the Body of Christ, to worship God, and to equip us through the Holy Spirit to go out into the world and make a difference. We use inclusive language and believe in a radical equality of persons. All are welcome to join us in prayer, and around the table of Christ. We practice an open table. In Trinity Chapel. Father David presiding. "It answers the longing I have felt throughout my life." "I found a home here." "It feeds the longing in my soul." "The Church promotes a depth of understanding, intimacy, and connection." "It is Catholicism the way I have always wanted it to be." "This is a safe harbor." "It's wonderful praying with like-minded people." "The constant message is peace." "Everyone here matters and everyone can have a purpose." "It's a community that talks the talk and walks the walk." "It's an authentic, loving, kind group. "We are a prophetic Church."